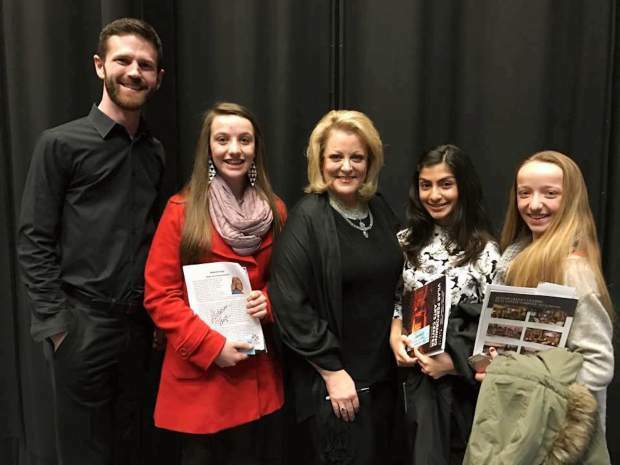 Opera mega star Deborah Voigt shared her life and performance tips with local Vail Valley voice students. From left, pianist Matthew Stephens; Caroline Dewell, Eagle Valley High School freshman who studies voice; Voigt; Maya Karbasi, Eagle Valley Middle School; and Lily Dewell, Eagle Valley Middle School. Voigt performs her gala evening featuring her finest operatic repertoire today at the Vilar Performing Arts Center at 6:30 p.m.